We produce for Italy and abroad christmas chocolate moulds. 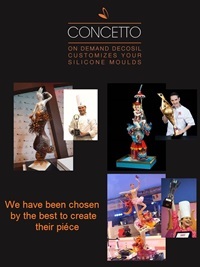 Italian leaders of silicone moulds, we create and sell for over 10 years christmas chocolate moulds, food safe silicone moulds worldwide to confectioners, bakeries and Delicatessens. CHRISTMAS DECORATIONS: TODAY YOU CAN EAT THEM! The latest trend is to decorate the Christmas tree with mouth-watering chocolate decorations to hang or to beautify the table for the big dinner with sweet little Christmas Angels to enjoy and share them with the loved ones during the sweetest festivity of the year. Christmas ornament chocolate moulds 3D MADE IN ITALY.